Disney has always found overbearing copyright protection to be an integral part of its business model, so much so that it has lobbied hard for copyright extensions while plundering the depths of the public domain for source material, shortsightedly failing to realize that one action undermines the other. Disney doesn't get named in too many infringement lawsuits, but like any studio with a big hit on its hands (in this case, Frozen, which just became the most successful animated film of all time), there's always the chance someone will come looking for a piece of the action. Unlike the multiple lawsuits filed against the creators of Avatar, this one, filed by animator Kelly Wilson, appears to have some merit. Wilson's animated short film, The Snowman, has been all over the internet since its release in 2010. It was even entered in several animated film festivals where Pixar employees "were present and competing" in the same category. Wilson doesn't say she personally showed this to Disney employees but she infers that there were many, many ways anyone could have viewed her creation prior to Frozen's development. She does note, however, that Disney's personnel had been supplied with copies of the animated work in the past. Plaintiff created The Snowman and submitted The Snowman—in part and in full—to Defendants as part of job applications on four different occasions from 2009 through 2012. The Snowman was also submitted via DVD to Defendants in 2010 as part of a job application from The Snowman’s co-creator Neil Wrischnik. Disney has surreptitiously appropriated Plaintiff’s valuable work The Snowman to create the FROZEN teaser trailer and the character of Olaf the snowman in FROZEN without any attempt to obtain authorization from Plaintiff or to accord her credit. One, she isn't going after Frozen itself, but rather its first trailer, which featured a storyline remarkably similar to hers. However, Wilson is looking to grab a part of any and all profits made by the movie because the allegedly infringing trailer was used to promote the film. Two, there are some very distinct similarities to her animated film, as she details in a series of screencaps contained in the filing. Beyond that, her filing links to other websites and writers who noticed the similarity between the Frozen trailer and Wilson's work, including a Slate writer whose daughter was disappointed the actual movie wasn't just about a wacky snowman. The case, as it's laid out by Wilson and her legal rep, is pretty solid. While there are a few areas that are rather gray (the similarities of any narrative -- antagonist/protagonist, ice is slippery, forest animals are exchangable, etc. ), many of the smaller details seem to indicate there's been some copying going on. First, in The Snowman, the snowman competes with the rabbits on the slippery ice to retrieve the carrot. Similarly, in the FROZEN teaser trailer, Olaf the snowman competes with the moose on the slippery ice to retrieve the carrot. Second, in The Snowman, the snowman is able to take hold of the carrot before the rabbit does. 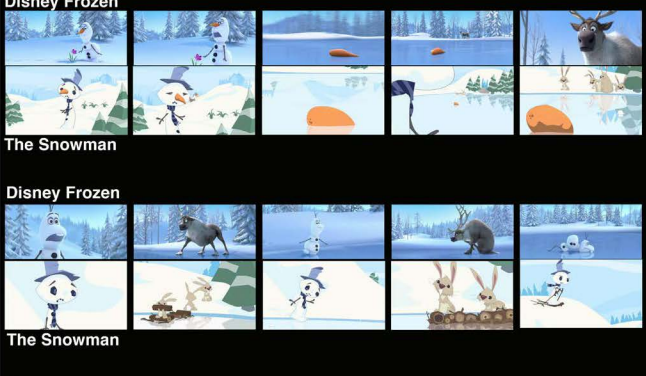 Similarly, in the FROZEN teaser trailer, Olaf the snowman is able to take hold of the carrot before the moose does. Third, in The Snowman, the snowman loses his carrot nose to the rabbit when both he and the rabbit have a grip on the carrot but the rabbit ends up wresting control of the carrot from the snowman. 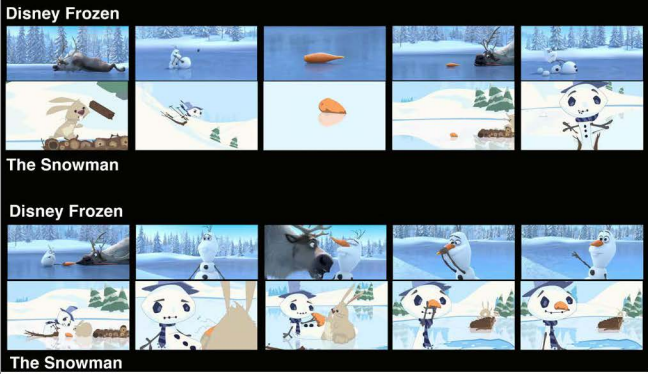 Similarly, in the FROZEN teaser trailer, Olaf the snowman loses his carrot nose to the moose when both he and the moose have a grip on the carrot but the moose ends up wresting control of the carrot from Olaf the snowman..
Wilson goes into much more detail in the filing, but her inclusion of independent parties who have noticed the similarities helps set this apart from other lawsuits in which the infringement noted was largely subjective. We'll have to wait for Disney's response to see where this is going, but this lawsuit does look a bit more valid than others that have been filed in the wake of runaway successes. As much as I'd personally like to see Disney get smacked for infringement damages, I'm personally a bit hesitant to back Wilson's claims that an infringed short film is due a cut of the profits made by Frozen, especially considering the allegations only cover a trailer whose events are not part of the larger film. In addition, the demands made might play right into Disney's hands. Wilson asks for Disney to account for "any and all profits" derived from the "exploitation" of The Snowman. Hollywood accounting has shown over the years that some of the most successful movies have yet to show a profit. Deploying enough creativity in the ledger could have Disney offering Wilson a cut of its "empty" pockets.